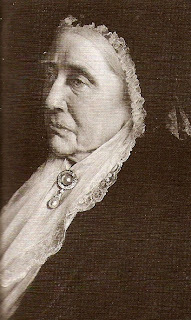 The Duchess of Cambridge, born Princess Augusta of Hesse, was Queen Mary's grandmother. The current British royal collection owes a fair debt to that non-Kate DoC; in addition to this lovely pearl trinket, the huge set of Cambridge emeralds came from her, and she was the inspiration for the Cambridge Lover's Knot Tiara. 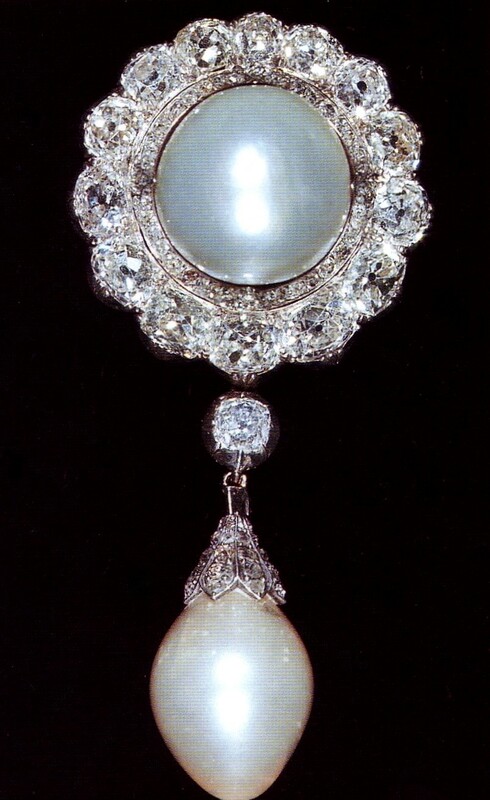 This brooch - a large round pearl framed in diamonds, with a baroque pearl held by a diamond clasp suspended below - was among the items inherited by Queen Mary when her grandmother died. She wore it for the christenings of the future Queen Elizabeth II and Prince Charles, among other events. 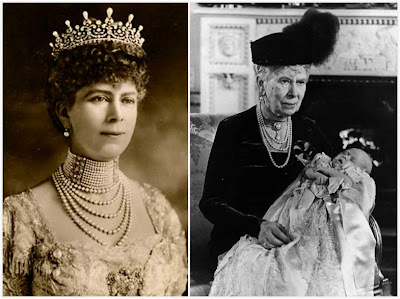 It transferred once again from grandmother to granddaughter when Queen Mary passed away in 1953 and Queen Elizabeth inherited her jewel collection. This is a simple piece, and is actually a pretty common brooch - well, as common as diamonds and big pearls get, that is. There are similar brooches in many other jewelry collections (here are a few for starters), and this same design is repeated in other stones within the queen's collection. But these are really the basic pieces you need for a great collection, wouldn't you say? This post is part of a series on the brooches of Queen Elizabeth II. Click here to see what we've covered so far.